Prime Minister Narendra Modi who describes himself as Hindu nationalist will unfurl the Tricolour from the Red Fort on October 21 to commemorate the 75th anniversary of the declaration of ‘Aarzi Hukumat-e-Azad Hind’ an Urdu term meaning Provisional Government of Free India on October 21, 1943 at Singapore by Netaji Subhash Chander Bose. Earlier Netaji had announced the raising of Azad Hind Fauj i.e. Army of the free India which is wrongly translated as Indian National Army (INA) on July 4, 1943 giving the famous slogan: “Give me blood! I will give you freedom”. Netaji as head of the Government also announced a Provisional Government for India which included SA Ayer, AN Sahay, Karim Ghani, Debnath Das, DM Khan, A. Yellapa, Sirdar Isher Singh, AN Sarkar, Aziz Ahmed, NS Bhagat, JK Bhonsle, Guizara Singh, AD Loganathan, Ehsan Qadir and Shahnawaz Khan. Bose used the slogan ‘Dilli Chalo’ to inspire thousands of soldiers in his historic address after taking over INA. The Provisional Government as well as INA represented diversity of India and all-inclusive freedom movement. If Provisional Government had ministers from all religions and regions so was the case with the INA. It was led by General Mohammed Z Kiani, Col. Inayat Kiani, Col. Gulzara Singh, Lt. Col Gurubaksh Singh, Col. Shah Nawaz Khan and Col. Habib ur Rahman and Captain Abbas Ali, Colonel Abdul Aziz Tajik and Col Prem Sehgal. Amazingly, Azad Hind Fauj also had ‘all-female’ combat regiment known as ‘Rani of Jhansi Regiment’ headed by Captain Lakshmi Sehgal, a military practice which was introduced much later in the world armies. It is true that INA did not succeed in its liberation struggle and with the victory of Allied forces in the World War II, it was routed. A total of 16,000 of the INA’s 43,000 recruits were captured, of whom around 11,000 were interrogated and tried by around ten courts-martial at the Red Fort, Delhi between 1945 and 1946. The first and most celebrated joint court-martial was of Prem Sahgal, Gurubaksh Singh Dhillon and Shah Nawaz Khan, belonging to three major religious communities of India. These court-martial proceedings galvanized whole of India in the support of the INA officers. The Congress took initiative to defend these officers of the INA by forming INA Defence Committee which included renowned lawyers like Jawaharlal Nehru, Bhulabhai Desai, Kailashnath Katju and Asif Ali. The three officers were awarded life sentences which were not executed. PM Modi on the eve of this event said in a statement: “I am honoured to participate in the programme. I know some people will criticize it. Let them do it. 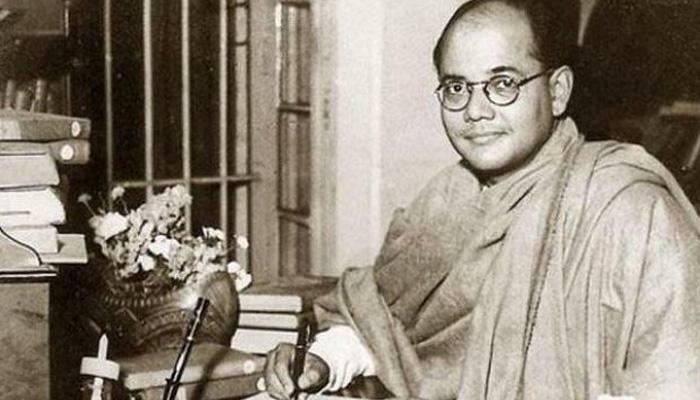 Everyone is aware how Netaji gave a challenge to British rulers when he formed his Azad Hind force. . One party had ruled Indian for more than 70 years, but it didn’t bother to make the files public.” It is true that Congress opposed Netaji and his aligning with Japan, Italy and Germany in the World War II. It is also true that Congress Government after Independence led by Nehru and Sardar Patel disbanded INA and on the suggestion of Lord Mountbatten former soldiers of the INA were not allowed to join the Independent India’s army. “The following Telegram was sent by Barrister V.D. Savarker [sic], the President of the Hindu Mahasabha to (1) General Wavell, the Commander in-Chief; and (2) the Viceroy of India on the 18th instant (July 18, 1941). It will be a sad day for India with glorious tradition of anti-imperialist struggle that children of those who criminally betrayed Netaji and his INA by siding with the British rulers are playing mischief with the icons of all-inclusive anti-colonial struggle. What right PM Modi has to talk of Netaji and INA which fought for a democratic-secular India when he as an ideologue of the RSS and BJP declares himself to be a Hindu nationalist, committed to turn India into a theocratic Hindu state and belittling the minorities? Those who love Netaji and his comrades who made supreme sacrifices for the liberation of India must demand that PM Modi fulfils only one task at Red Fort of October 21, 2018, that is to seek forgiveness for the crimes which RSS and Hindu Mahasabha committed against Netaji and his INA. The traitors should not utter a word about Neta Ji. He was a great warrior for the independenc of INDIA. Whereas RSS was organised by the Britishers to organise and devlop communal hatred in between the communities. When the whole of INDIA was fighting against British Raj RSS was the greatest supporter of Britishers. So for election purpose don’t show love for NETA JI SUBHASH CHANDER BOSE. On September 30, 1943 when Netaji Subhas Chandra Bose toured Andaman as the supreme commander of Azad Hind Fauz, he paid his tributes to the memories of freedom fighters imprisoned in the Cellular Jail. He got printed thousands of copies of the Tamil version of Savarkar’s Indian War of Independence of 1857 and distributed them in public.